Truro City manager Steve Tully said he was frustrated with his side's defending in their 3-1 home defeat by promotion rivals Maidstone. Ryan Brett levelled for the Cornish side, who conceded all three goals from long-throws at Treyew Road. "You can't concede three soft goals like that and expect to win a football game," Tully told BBC Radio Cornwall. 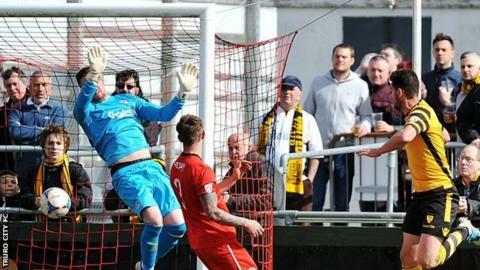 "We all knew that Maidstone are a very good set-piece team and we didn't deal with that." The result sees Truro drop to fifth, the final National League South play-off spot, two points clear of Maidenhead. However, Tully's side have three games in hand on most of the teams around them. "You look at the game overall and I can't fault the endeavour and the work-rate of the lads - I thought they gave everything," he added. "We now know what we've got to do - we need seven points out of five games to finish fourth, which I believe we deserve. "I do feel, at the moment, we seem to be playing better away from home. I don't know why that is but we do."